The conversation in education has lately revolved around how to prepare students for jobs that don’t yet exist. 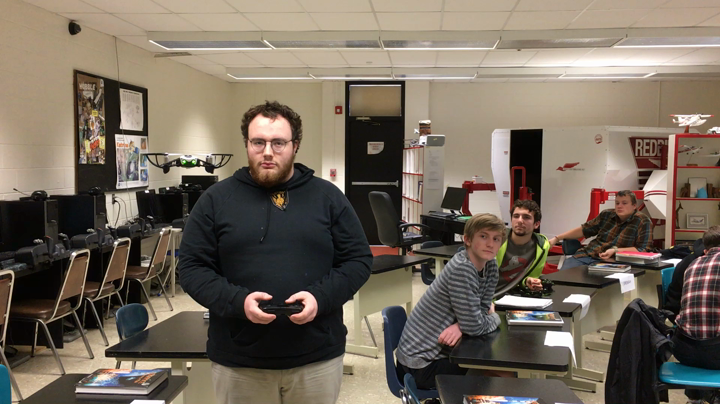 The new small Unmanned Aerial Systems (sUAS) course, which began this semester at Elizabethton High School, prepares students for emerging careers in drone operation. By the end of the course, students are prepared to test for the Remote Pilot Certificate, which qualifies them for a variety of jobs, and prepares them for a rapidly evolving field. “I think the careers with this license are unlimited because the jobs these guys are going to get into mid-career haven’t even been developed,” said Aviation and sUAS Instructor Mr. Dan Mills. The course is one of only a few of its kind in the state and is available to students who have completed two prerequisite courses in either Engineering or Aviation. Upon course completion, testing for the Remote Pilot Certificate is optional. All students currently enrolled plan to test for theirs. The certificate is awarded by the Federal Aviation Administration and recognized nationwide. Students say the coursework is giving them a good understanding of regulations related to drones and helping them predict how those laws and careers may evolve. Senior Lucien Tester said it is a good application of principles they learn in other classes like physics, fundamentals of aviation, and programming.